The Reality of Sexual Assault ..
How the culture surrounding tipped workers affects an employee’s wage. If you’ve ever gone out to eat, you probably know it’s customary to leave your waiter a 15 to 20 percent tip. But do you tip your barista? After six years working in coffee shops, Aiki Coxhead — a 24-year-old DePaul student — had come to rely on extra income she picked up through tips. On good days at her job as a barista at Dollop Coffee in the Loop, she could net about $5 more per hour than her base wage, enough to comfortably cover basic necessities. Coxhead said that extra tip money made a substantial difference in how anxious she was about grocery money or just paying certain bills. But at her other barista gig at Colectivo Coffee in Lincoln Park, the tips were “a joke,” Coxhead said. According to a manager for the chain, Colectivo doesn’t have a system in place that allows customers to tip when they pay on a card, which means Coxhead only received cash tips. This amounted to $30 a week, she said — working full time, that meant tips were only about an extra $1 per hour on top of her $13 an hour shift lead wage. Many customers don’t realize their seemingly small tips — doled out mostly on a whim or by circumstance — can have a significant impact on a barista’s overall income. Some baristas, similar to servers or bartenders, are paid what is known as a tipped wage, which is less than the state or federal minimum wage. In these instances, the difference between an extra $1 an hour and $5 an hour can be the difference in making minimum wage or below. So how much do your tips matter? How does your extra dollar affect the livelihood of service industry workers? To learn more about how tips and tipped wages affect Chicago baristas, 14 East talked to local experts and conducted a survey of 25 coffee shops across the city. Here’s what we found. First of all…why are baristas considered tipped workers? And why does it matter? A tipped worker is an employee whose direct hourly wage is under the legal minimum, with the law requiring that they will make up the difference through tips. In Chicago, where minimum wage is $11 an hour, the tipped wage is currently set at $6.10, though employers can set their rate for tipped wages anywhere between the two. For the most part, any employee who receives a base amount of monthly tips may be considered a tipped worker. According to the U.S. Department of Labor (DOL), Illinois employees receiving more than $20 in tips a month can be paid a tipped hourly wage. That’s a lower threshold than the federal standard, which rules that employees have to be paid $30 a month in tips to be considered tipped workers. The federal tipped minimum wage is also much lower at $2.13 an hour, though only 18 states use that rate. Twenty-four states — Illinois included — allow employers to pay above the federal tipped wage but below minimum wage. The remaining eight states have abolished the tipped wage, meaning all employees make at least an hourly minimum wage. Wage rates can vary by municipality, too, which is why Chicago has a higher tipped wage ($6.10) than Illinois ($4.95). Chicago City Council passed an ordinance in 2013 that will raise minimum wage to $13 by 2019. As a result, Chicago’s tipped wage will be adjusted each year based on the Consumer Price Index (CPI), a metric that catalogs the average prices of consumer goods and is often used as an economic indicator of inflation. Like Coxhead mentioned, tipping depends on a host of factors — store location, season, whether or not customers have an option to tip with credit card. But beyond that, many customers simply don’t know whether or not they’re “supposed” to tip baristas, or if it’s just a gratuity for especially good service. 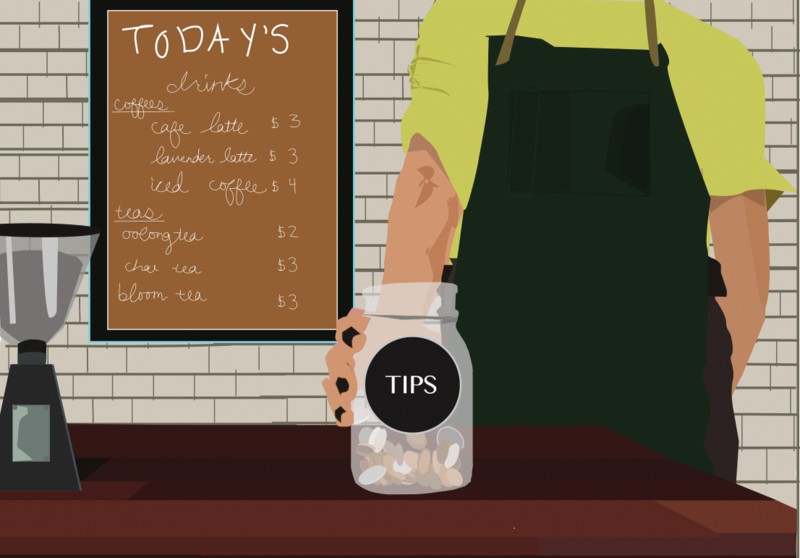 Basically: tipping in coffee shops isn’t as culturally ingrained as tipping in a restaurant, yet some baristas are just as reliant on tips as servers to make a minimum hourly wage. What happens if a barista realizes they are not making minimum wage? If a tipped worker’s wages do not add up to Chicago’s standard minimum of $11 an hour, their employer is legally required to make up the difference. However, Dickson said, it may be difficult for employees to seek recourse if their employers fail to adequately compensate them. Employees can file complaints with the Illinois or federal DOL, but that process may be slow and arduous. Even when a state-level DOL rules in an employee’s favor, enforcement often lacks teeth — a Politico report released last week found that most states often lack the resources to ensure employees receive those wages after an investigation. According to the report, Illinois has fewer than 10 investigators to enforce the minimum wage across the entire state. In August 2017, the Chicago Reporter argued that because of ineffective enforcement, wage complaints decreased 40 percent from 2010. Dickson said the better option would be to consult a worker center — an organization designed to provide support and mediation for nonunionized low-wage workers. Carolyn Morales is a worker center organizer at Arise Chicago, where she helps coordinate workers into campaigns. Arise’s goals are to educate, organize and send employees back to their workplace to further educate their co-workers. Morales said the direction she’ll point an aggrieved employee in depends on a variety of factors, such as whether they want to keep their job or if they want to deal with the legal system. Arise hosts a “Know Your Rights” workshop around once a month at their home base in the West Loop, where staffers give a brief overview of employees’ legal rights in English, Spanish and Polish upon request. Morales often sees employees who may not be aware they’re being cheated until they undergo the process for documenting hours and wages. She said the easiest way to discover if an employee is making minimum is to show them the amount of money they should be making, assuming their employer complies with the law. Once they have that number, they can compare it to what they’re actually making. Whatever the workplace issue is, Morales recommends that all action be taken along with a group of co-workers — this legally creates a form of collective bargaining that protects them from retaliation under the National Labor Relations Act. Before taking legal action, a group of employees can approach an employer about a violation of their legal rights (such as not making the minimum wage) and provide a written list of demands, establishing a timeline for when their rights should be met. Having demands in writing — and signed by each individual — provides documentation and protection under the law. When we began our reporting, we wanted to know whether any coffee shop employees were making below minimum wage because of their tipped wages. Of the 25 coffee shops we surveyed, six employees reported being paid a tipped wage, ranging from $8.25 to $10.50 an hour. However, none of the coffee shop employees we spoke to reported being paid less than minimum wage, even those who were paid a tipped wage. Map: Cody Corrall, 14 East. This is just our preliminary data. With the help of students and Chicagoans, we’re looking to explore further. There are many more coffee shops throughout the City of Chicago, and we want to expand our data to be more comprehensive. So we’re soliciting your help — send us an email to learn more about our reporting process, and how you can start surveying coffee shops in your neighborhood to join this project. You can reach Emma Krupp at emmakrupp96@gmail.com and Megan Stringer at mstringerpilot2015@gmail.com. The issue isn’t limited to coffee shops, either. Dickson and Morales both stressed that tipped workers are cheated out of wages throughout the service industry, whatever the reason. Even when a worker documents and reports their case, they still might not earn the minimum wage they’re entitled to under the law — whether because of ineffective enforcement, immigration status or unscrupulous employers. Moreover, the minimum wage rate can vary widely depending on the city and state of the workplace. A barista in the nearby suburb of Cary, Illinois — where minimum wage is $8.25 an hour — may be paid the state tipped wage of $4.95 an hour. Across the border in Gary, Indiana, a different barista could be paid the federal tipped wage of $2.13 an hour. At the end of the day, tips aren’t just goodwill — for tipped workers, they’re a part of the wage. In most industries, an employee’s wage is decided by the employer. But for service workers and other tipped employees, tips mean a final wage can be decided directly by the client that employee is serving. This is a rarity outside the service sector. Because of this, eight states — such as California, Oregon and Minnesota — have completely eliminated the tipped wage. This means tipped workers are paid the state’s hourly minimum wage. Midterm elections are forthcoming, but none of Illinois’s gubernatorial candidates — Democratic or Republican — has made eliminating the tipped wage part of his or her campaign platform. It’s important to recognize that there is no standard for why a customer tips. People are looking for different experiences from their baristas and servers, and there’s no way for the employee to know what experience each individual person is inclined toward, unless they’re a long-time regular.